Overall, more efficient practices using fewer inputs of fertilisers and herbicides have improved economic returns due to the reduced input costs and have water quality benefits. Timing of nutrient and herbicide applications in relation to rainfall are important factors for nutrient and herbicide losses in runoff. The purpose of this project is to investigate the effects on water quality of different levels of soil management and nitrogen and herbicide application across seven different treatment plots south-west of Mackay. A monitoring site was established in the Sandy Creek catchment, south-west of Mackay, in 2009. 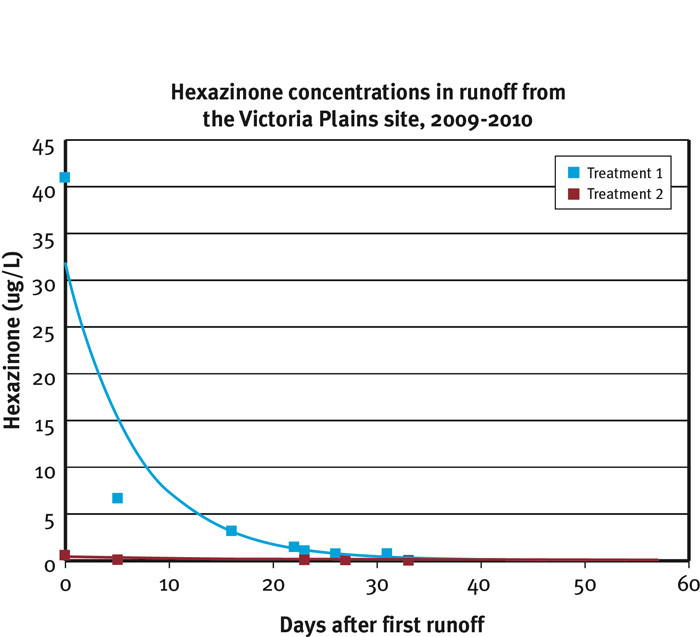 The site, on a Victoria Plains soil, has two 1.1 hectare treatments: one with 1.5 metre single rows, ‘traditional’ fertiliser rates and the use of residual herbicides (diuron/hexazinone); and the second with 1.8 metre single rows (controlled traffic), Six Easy Steps fertiliser application rates and the use of knockdown herbicides. Rainfall, runoff quantity and quality, soil water quality and farm operations were closely monitored during the 2009-2010 wet season with up to 15 rainfall events causing runoff. Runoff from the plots was collected automatically and measured for suspended sediment, nutrients and herbicides, and the results compared between the different treatments. Soil water solution (drainage) samples were collected twice from each treatment plot at a soil depth of 0.9 metres. The 2009–2010 wet season was one of the wettest years on record. This saw high runoff volumes from all seven treatment plots which probably caused higher losses of pollutants than would occur in drier years. Improvements in soil moisture due to the treatments were difficult to evaluate under these conditions. The trial site demonstrated that matching row spacing to machinery track width (1.8 metre row spacing) to enable controlled traffic tillage reduced runoff by 18 per cent, improved soil moisture and reduced pollutant loads while maintaining cane yields when compared to 1.5 metre conventional tillage. Matching nitrogen inputs to soil type and crop requirement can substantially reduce nutrient levels in runoff. A planting mix of diammonium phosphate (DAP) was applied to both treatments, which included 38 kilograms of nitrogen per hectare. 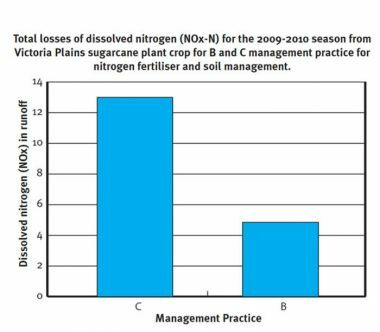 Additional nutrients were added to one treatment, bringing the nitrogen rate up to 133 kilograms per hectare (C management practice for nutrients) which resulted in much higher nutrient levels in runoff. The second treatment did not receive any additional nutrients (B management practice for nutrients) resulting in lower nutrient levels in runoff. 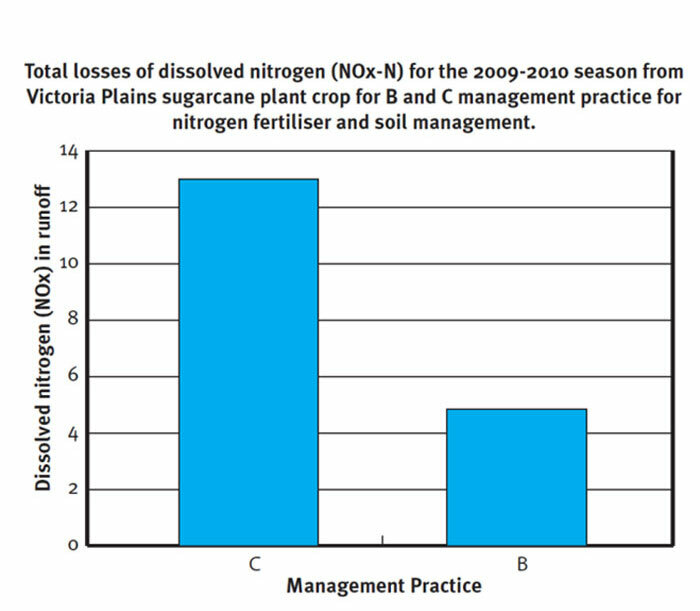 The existing soil nitrogen was high due to a legume crop grown in the preceding fallow. Two herbicide treatments were applied. 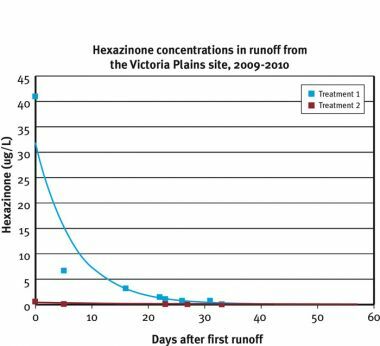 Treatment one involved residual herbicide Velpar K4 (diuron 468 grams/kilogram and hexazinone 132 grams/kilogram). Treatment two involved knockdown herbicides Gramoxone (250 grams/Litre paraquat as paraquat dichloride), Baton (2-4 D as dimethylamine salt), MCPA 250 (250 grams/Litre MCPA as sodium salt) and Starane 400 (333 grams/Litre fluroxypyr as the methyl heptyl ester). 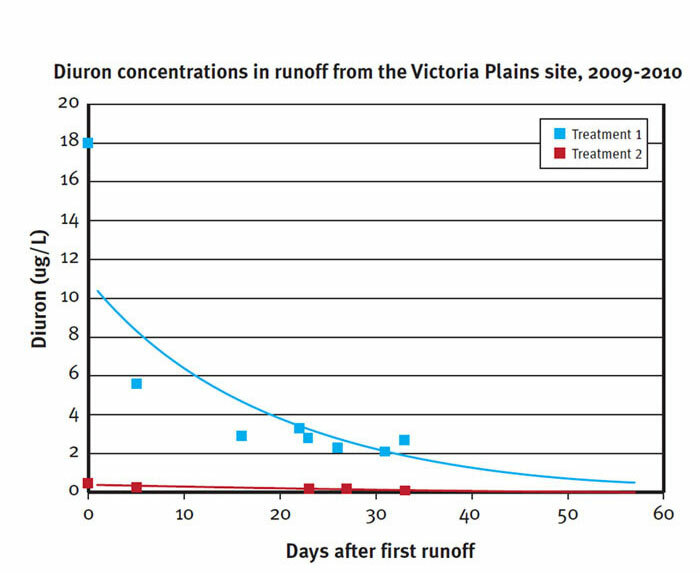 Herbicide residues of diuron and hexazinone were particularly elevated in the first two runoff events (within 14 days of application) from treatment one (Velpar K4 applied). These two runoff events represented 64 per cent and 91 per cent of the season’s diuron and hexazinone losses, respectively (but only 11 per cent of the runoff). 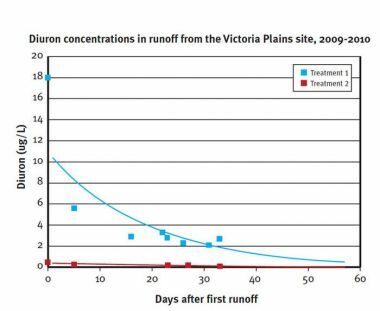 In treatment two, trace levels of diuron and hexazinone were detected in all runoff samples at concentrations of 1 micrograms/Litre or lower. These levels are thought to be residual concentrations from previous applications. In addition to the water quality benefits, the net return (excluding land preparation, irrigation, fertiliser other than nitrogen and fixed costs (other than harvesting)) of treatment two was 13 per cent higher than treatment one. This was primarily due to the reduced input of fertiliser and greater efficiency of farming wider rows.